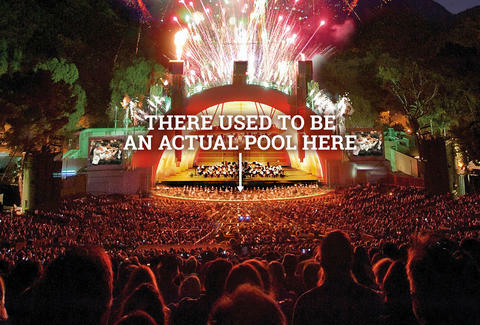 You've been to the Hollywood Bowl, maybe just once, maybe definitely not just once. Either way you've been, which means you know some basic stuff about it. 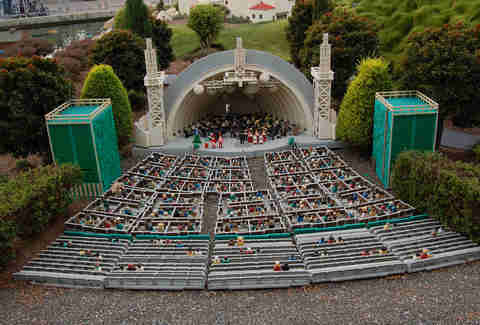 (It's an amphitheater! You can see the Hollywood sign from your seat! Other basic stuff!) What you don't know is the super-not-basic stuff, like how there used to be A POOL IN FRONT OF THE STAGE, or how there's A HIDDEN BATHROOM IN THE TREES. 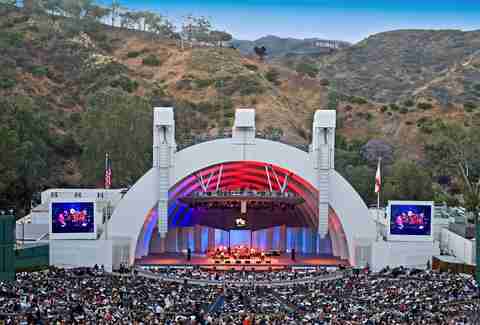 Well, with this week marking the official first show of the Hollywood Bowl season (the Lana Del Rey and Tony Bennett with Lady Gaga shows weren't "official" apparently? 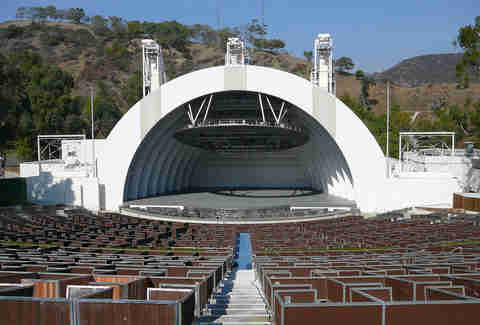 ), we figured it was time to fill you in on both of those and so, so, SO much more Hollywood Bowl awesomeness. 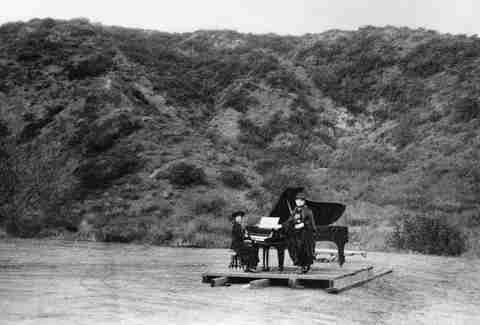 It was a piano concert with two ladies dressed in ultra-crazy clothes. There was no stage, just a couple of boards. And they didn't have sushi. 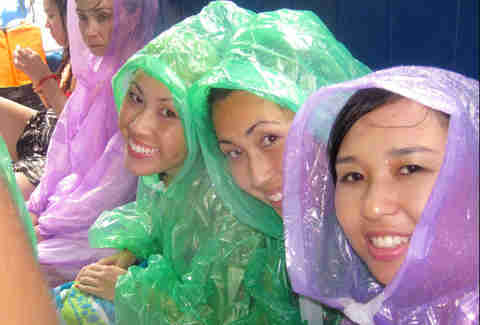 The horror!!!! It was totally obviously set by French singer Lily Pons in 1936. Totally. Obviously. The current capacity is just over 17,000. Yep: those seats where all the fancy people sit right at the front literally used to be full of water separating performers from the audience, hence the name of the section. All 100,000 gallons were drained in 1972. Gotta go, bad, and don't want to deal with the lines at the main bathroom? Up and to the left is a bathroom with WAY shorter lines, 'cause no one knows it's there. The problem is... getting there is a literal uphill battle. Good luck. As legend has it, a fugitive shepherd from Mexico buried an "amazing treasure" in the 1860s in what's believed to now be the Hollywood Bowl parking lot. 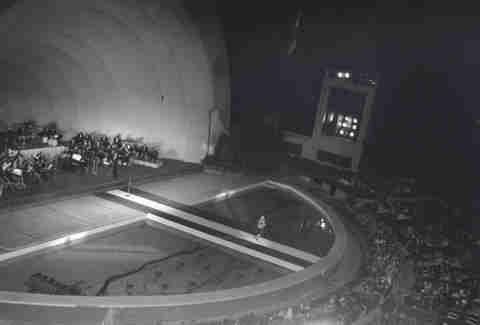 Like REALLY believed: in 1939, the county issued a permit for two mining engineers to dig for the reputed treasure in one of the Hollywood Bowl parking lots. Nothing was found. That melee at the front? Terrible. Bypass it by walking past it up the hill: there's an entrance in the middle of the venue, before the Bowl, or you can walk past backstage and use the west entrance, which never has a line of any kind. Want to run the stairs? Sure. Want to have a quiet lunch? Okay. Want to get onstage and play? Sorry, they put a net over the stage to prevent you from doing that. BOOOOOO. If you're willing to get up early, rehearsals are often open to the public the day of the show, so from about 9:30am-12:30pm, you can go and check out soundcheck (unless the act has requested it be closed). How can you tell? Take a look at the schedule and see if it's a "Lease" event or not. If it's not, go nuts: coolers, picnics, and booze in its own bottles. If not, you've got to get creative. In other words, want to pay rent this month AND valet your car? Too bad. One of the busiest nights at the Bowl is... Oscar Night? Yeah: even though the bowl is closed in Feb, they rent out the parking for limos taking people to and from the Dolby down the street -- and they fill up long before the show actually starts. Right when shows go on sale, they're often $1 for the very, very back of the venue, which never fills up all the way (thanks to people shuffling their way forward), so there's actually room to spread out, which means there's room to party. And people do. Who needs more than video screens anyways? Yep, just like the White House. Jeff Miller also knows where some secret neighborhood parking is nearby. He just doesn't know the street name of the secret parking, only that it's under a tunnel he can get to by muscle memory. Try to wring the location out of him at @jeffmillerla on Instagram and Snapchat, and @ThrillistLA on Twitter.